—Dogs Available In Southern Cal. 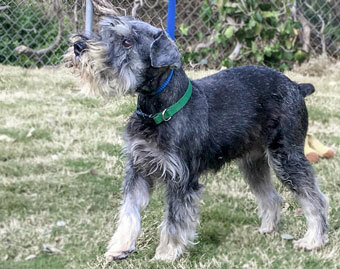 The adoption application form for dogs in southern California (unless otherwise stated for a particular dog) is at www.schnauzers.us/adoptionformsouth.html. 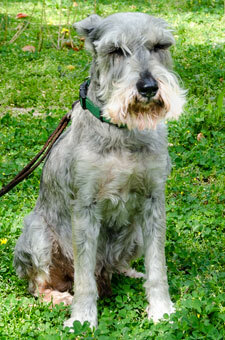 Max is a very, very nice Miniature Schnauzer who is about 10 years old. Max was surrendered to us by a lady who had taken him in when his former owner moved to New Mexico and said she was unable to take Max. Max weighs about 18 lbs. Max is pretty lively for his age. He gets along well with everyone. He wanted to greet everyone—human, canine and feline—at the vet's office. Max had a large growth on his back which we had removed. (We had it biopsied and it was benign.) We also had a dental and blood work done. Max's blood values were great for a dog his age. He had a few teeth removed during his dental. We just had him groomed and the groomers remarked on how well behaved he was. Max is in good health. He is neutered, microchipped and current on vaccinations. Max is being fostered in La Cañada. If you would like to adopt Max, please submit a completed Adoption Application form. Contact John Hoffman at cmsr@johnehoffman.us with any questions about Max. 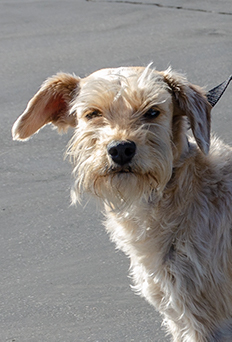 Corinne is a very sweet approximately 1-1/2 year old tan Miniature Schnauzer mix, who we rescued from the Chula Vista shelter. Corinne weighs about 15 lbs. Corinne is a quiet but friendly girl who gets along well with people and with other dogs. We do not know how she is around cats since we don't have any cats to test her on. Corinne had a broken scapula. We took her to our surgeon who said the scapula was healing well and that Corinne did not need any special treatment. He was correct. Corinne now runs and jumps as though she had never had an injury. Corinne is spayed, microchipped and current on vaccinations. She is eating well. Corinne is being fostered in La Cañada. If you would like to adopt Corinne, please submit a completed Adoption Application form. Contact John Hoffman at cmsr@johnehoffman.us with any questions about Corinne. Jason is a very sweet approximately 1 year old black and tan Miniature Schnauzer mix, who we rescued from the high-kill Changwon shelter in Korea. He is a little guy, weighing about 11 lbs. Jason is playful, friendly with people and other dogs, and LOVES Jenny (who looks like she could be his littermate). We think it would be best to place them together if at all possible. Jason appears to be in good health. He is neutered, microchipped, current on vaccinations, heartworm negative, and has had his teeth cleaned. Jason is being fostered in La Cañada. If you would like to adopt Jason, please submit a completed Adoption Application form. Contact John Hoffman at cmsr@johnehoffman.us with any questions about Jason. Jenny is a very sweet approximately 1 year old black and tan Miniature Schnauzer mix, who we rescued from the high-kill Changwon shelter in Korea. She is a little smaller than her brother, Jason, weighing about 9 lbs. Jenny is playful, friendly with people and other dogs (though a bit more reserved than is Jason), and LOVES Jason (who looks like he could be her littermate). We think it would be best to place them together if at all possible. Jenny appears to be in good health. She is spayed, current on vaccinations, microchipped, heartworm negative, and has had her teeth cleaned. Jenny is being fostered in La Cañada. If you would like to adopt Jenny, please submit a completed Adoption Application form. Contact John Hoffman at cmsr@johnehoffman.us with any questions about Jenny. 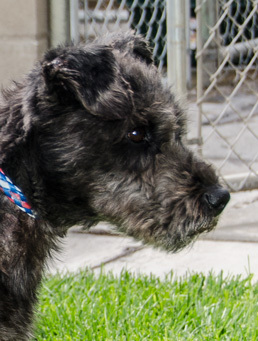 Candy is a very sweet approximately 10 year old purebred Miniature Schnauzer, who we rescued from the Riverside Coachella shelter near Palms Springs. Candy weighs about 15 lbs. Candy is a quiet but friendly girl who gets along well with other dogs.. We do not know how she is around cats since we don't have any cats. Candy is spayed, microchipped and current on vaccinations. Her teeth were bad when we got her. She had a dental done and lost all but 2 teeth in the process, but we had those two cleaned and polished. Candy is an eager eater. She can eat kibble, but not hard biscuits. 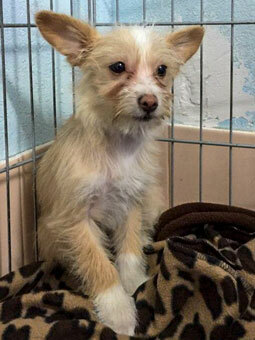 Candy is being fostered in La Cañada. If you would like to adopt Candy, please submit a completed Adoption Application form. Contact John Hoffman at cmsr@johnehoffman.us with any questions about Candy. 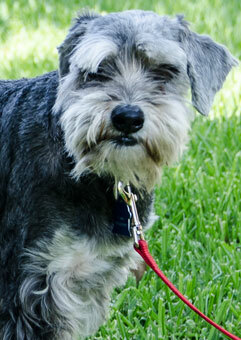 Toby is a super friendly salt & pepper Miniature Schnauzer, who we rescued from the Los Angeles North Central shelter. The shelter had estimated his age at 10, primarily because his teeth were so bad. We had a dental done. Poor Toby lost most of his teeth, but he is feeling a lot better now, and eating with a lot more gusto than before. He seems a lot younger than 10. We and the vet estimate his age at about 7. Toby loves to play, play, play. He loves his foster mom and he loves to play with the other dogs at his foster home. He will be a great companion to whoever adopts him. Toby always seems to have a smile on his face. Toby appears to be in good health. He is neutered, microchipped and current on vaccinations. Toby has natural ears and a natural tail. Toby is being fostered in Pasadena. Please submit a completed Adoption Application form if you'd like to adopt Toby. Contact John Hoffman at cmsr@johnehoffman.us for more information about Toby. Hamilton is a white Poodle. He is about 9 years old. He was rescued after his previous owner passed away. Hamilton is very sweet, active and perky. Hamilton loves everybody and gets along with all furry friends! After a major dental (our boy had to lose a big tooth!) and some TLC, Hamilton is ready for a loving home, fun walks ( he loves it!) and lots of cuddles. Hamilton appears to be in good health. He is fully vaccinated, microchipped and neutered. 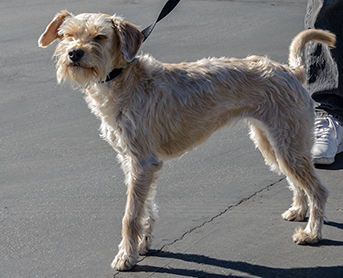 Hamilton is being fostered in Los Angeles. Please contact Virginie Haudrechy at virginiehaudrechy@yahoo.com or 310 200-4344, for more information about Hamilton. This is a courtesy listing for Virginie Haudrechy, who furnished the above information about Hamilton. CMSR has not seen or evaluated Hamilton. Agatha is a cream/white Chihuahua/Maltese mix. Abott is a tan Chihuahua/Dachshund mix. The puppies are about 4 months old and can best be described as Chi Fusion. Agatha and Abott are adorable together. We hope to place them together as they entertain each other, play and cuddle all day!! The puppies will be spayed and neutered soon. They will be microchipped and current on vaccinations before placement. Agatha and Abott are spayed and neutered, microchipped and current on vaccinations. 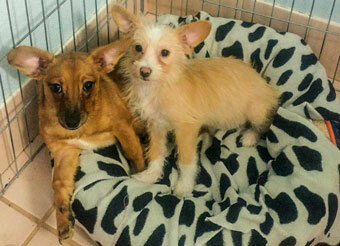 Agatha, Abott and the puppies are being fostered in Los Angeles. Please contact Virginie Haudrechy at virginiehaudrechy@yahoo.com or 310 200-4344, for more information about them. This is a courtesy listing for Virginie Haudrechy, who furnished the above information about Agatha, Abott and the puppies. CMSR has not seen or evaluated any of them. Fred was rescued from the Lancaster shelter, where is was going to be euthanized because he had pneumonia. Fred is about 2 years old. Fred has been fully vetted and he is now healthy. Fred is very gentle and sweet. He would do best in a calm, loving home where he can blossom and settle. Fred is neutered, microchipped and current on vaccinations. Fred is being fostered in Los Angeles. Please contact Virginie Haudrechy at virginiehaudrechy@yahoo.com or 310 200-4344, for more information about Fred. This is a courtesy listing for Virginie Haudrechy, who furnished the above information about Fred. CMSR has not seen or evaluated Fred. Titan is a beautiful 10 month old Chihuahua. Titan loves kids, adults and other dogs. He is always happy and ready to play and cuddle. Titan appears to be in good health. He is neutered, microchipped and current on vaccinations. Titan is being fostered in Los Angeles. Please contact Virginie Haudrechy at virginiehaudrechy@yahoo.com or 310 200-4344, for more information about Titan. This is a courtesy listing for Virginie Haudrechy who furnished the above information about Titan. CMSR has not seen or evaluated Titan. 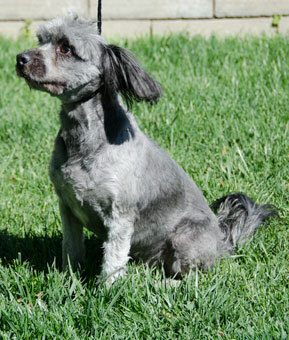 Bennett is an about 4 year old Shi-Tzu/ Bichon mix. He weighs about 16 to 17 lbs. Bennett loves everybody (humans & dogs) and is very easy going. He is a complete fluff ball. He enjoys a good walk as well as a cuddle! And he has the cutest underbite too!! Bennett appears to be in good health. He is neutered, microchipped and current on vaccinations. 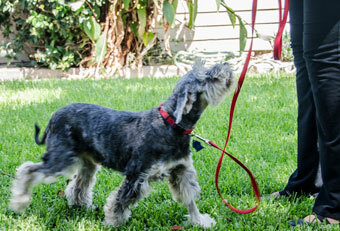 Bennett is being fostered in Los Angeles. Please contact Virginie Haudrechy at virginiehaudrechy@yahoo.com or 310 200-4344, for more information about Bennett. This is a courtesy listing for Virginie Haudrechy who furnished the above information about Bennett. CMSR has not seen or evaluated Bennett. Twiggy is a 1– 1/2 year old Papillon mix. She weighs 7 lbs. Twiggy is a little firecracker—a huge personality in a tiny body. Twiggy is energetic and funny. She will chase her tail at full speed, and will mimic a police siren when she hears it. She is a complete entertainment package! But Twiggy is also crate trained. She will nap and sleep happily in her crate. Twiggy appears to be in good health. She is spayed, microchipped and current on vaccinations. Twiggy is being fostered in Los Angeles. Please contact Virginie Haudrechy at virginiehaudrechy@yahoo.com or 310 200-4344, for more information about Twiggy. This is a courtesy listing for Virginie Haudrechy who furnished the above information about Twiggy. CMSR has not seen or evaluated Twiggy. 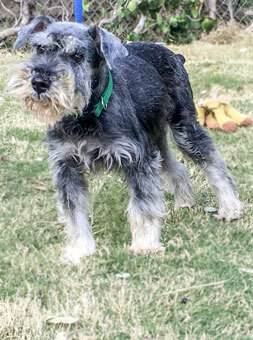 Skrappy Sox is a purebred Miniature Schnauzer who was surrendered to us by his owner. He is about 6 years old and weighs about 23 lbs. He has natural ears and an undocked tail. Skrappy Sox's former owner said he nipped one of her kids. We can only guess what the kid was doing to provoke Skrappy because he has been a perfect gentleman since he has been with us. He is very friendly with people and gets along with other dogs. We haven't had him around cats or young kids. Skrappy Sox appears to be in good health. He is neutered, microchipped and up to date on vaccinations. Skrappy Sox is now with A Home 4 Ever Rescue in Costa Mesa. If you are interested in adopting Skrappy Sox, please email Mark at ahome4ever@gmail.com or Erin at muellenbergerin@gmail.com. This is a courtesy listing for A Home 4 Ever Rescue. 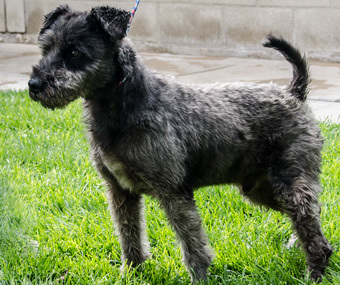 Smokey is a black and gray terrier mix, who is about 2 years old. We rescued Smokey from the San Bernardino City shelter. He weighs about 13 lbs. Smokey is a bit on the timid side, but is very affectionate once he gets to know you. He gets along with other dogs. We have not had him around cats or young children yet. We think Smokey would likely be best in an adults-only home or one with teenagers. Smokey appears to be in good health. He is neutered, microchipped and current on his DA2P vaccination. He will be up to date on his rabies vaccination before placement. 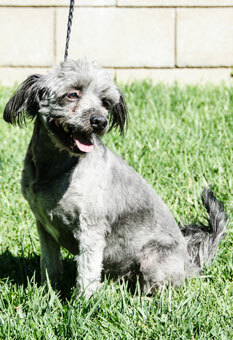 Smokey is being fostered in Palmdale. Please submit a completed Adoption Application form if you'd like to adopt Smokey. 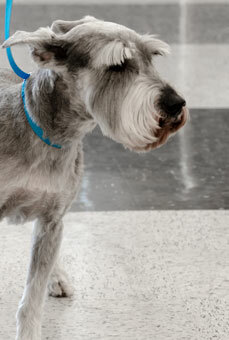 Contact John Hoffman at cmsr@johnehoffman.us for more information about Smokey.